Chief Burguk, an Orc warrior, is the chief of Dushnikh Yal, the Orc stronghold south of Markarth. He is the master trainer in One-handed and can train you up to level 90. A bit of a braggart, he will challenge you to a brawl to prove he is superior. 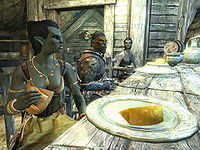 Due to Orc tradition, Burguk has several wives, including forge-wife Gharol, hunts-wife Arob, and his favored wife Shel. While the first two wives merely act as symbolic marriages, Shel gets all the attention from the chief and is the one who gets to spend time with him when he sits outside his longhouse between 7am and 7pm, doing nothing but watch the other tribe members work. At 7pm he heads inside the house and enjoys a five-hour dinner surrounded by his wives and sons, until he finally goes to bed at midnight. He wears an almost-complete set of leveled heavy armor (up to Orcish quality at level 25), including a cuirass, boots, gauntlets, and two shields. He wields a leveled mace and carries the key to the longhouse, a pair of ragged trousers, and some common items and gold. When you talk to him, he will introduce himself by saying, "You speak to Burguk, chief of Dushnikh Yal." You can ask him further about the stronghold and he will point you in a couple directions, saying, "You need steel? Speak to my forge-wife, Gharol. ", "Need a poison for your hunting? My mother, Murbul, knows several." He will remind you of the power of Orcs by saying, "This stronghold respects strength, and strength alone." If you ask him about training, he shows his pride by telling you, "You'll never compare to me, but I can try and teach you anyway." If you are low on money when you speak to him, he will comment, "You're short on coin." Chief Burguk is also related in some way to Lurbuk, an unspeakably bad bard residing in Morthal. 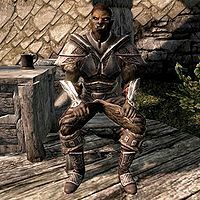 Should Lurbuk be silenced in someway prematurely, a courier will deliver a letter of thanks to the Dragonborn signed by Burguk essentially thanking them for offing his embarrassing relative. Shel: "My chief, Gharol threatens to have me work in the mines. You won't allow my pretty hands to dirty, will you?" Burguk: "No, my wife. You have been given other gifts to please your chief than mine work. I will talk to Gharol and all will be well." Shel: "Oh, thank you my chief!" Burguk: "I saw you working the forge today, wife. Your muscles have grown strong from the metal shaping!" Gharol: "Do they, my chief? Am I now favored enough to replace Shel by your side at the feast? Back your words with action!" Burguk: "No more talk of Shel. As chief, I will do what I please, so point your fiery gaze to our enemies." Burguk: "Tell me, mother, does Malacath favor our stronghold?" Murbul: "He is pleased. Ours is the strongest tribe in all the Reach." This page was last modified on 7 July 2018, at 18:05.